What better way to begin a new year than with a fresh reminder from Slab Magazine that the “Berliner Republik” is crumbling! Yes! It is falling apart at the seams! 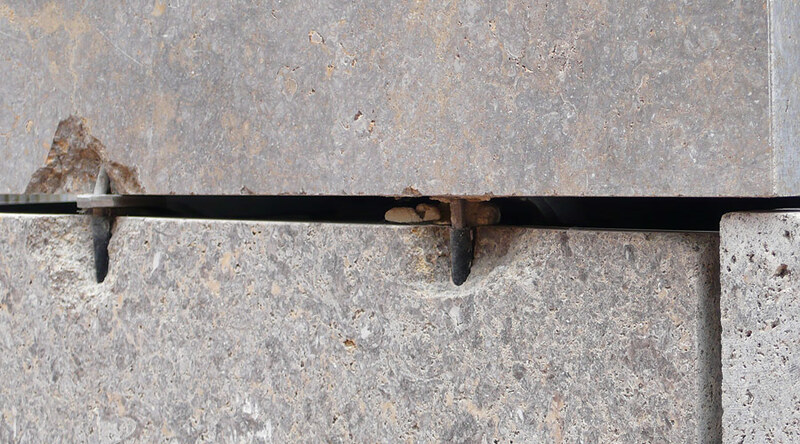 Cast your mind back to April 2011 (or open another tab, if you wish), and you might recall a similar case in this series, where the anchoring pins of a sandstone panel had become painfully visible. I claimed that the phenomena was not uncommon, so feel duty-bound to reveal another example of façade-failure, this time affecting the generically named “Bürohaus Neue Grünstraße 22”. Whilst listed in the Senate Department’s database of post-1990 architecture (here), the office building seems to have been disowned by its architects: “no data available”. Even the client is anonymous, and the Senate has no record of when building work begun or was completed. It is a textbook example of the “Planwerk Innenstadt” building typology: six stone-clad floors of misery punctured by a monotonous cooky-cutter grid of windows. Ah yes. Stone cladding. It’s not as though Berlin isn’t short of a good example: Emil Fahrenkamp’s Shell-Haus of 1932, is masterful proof that the technique isn’t evil per se. 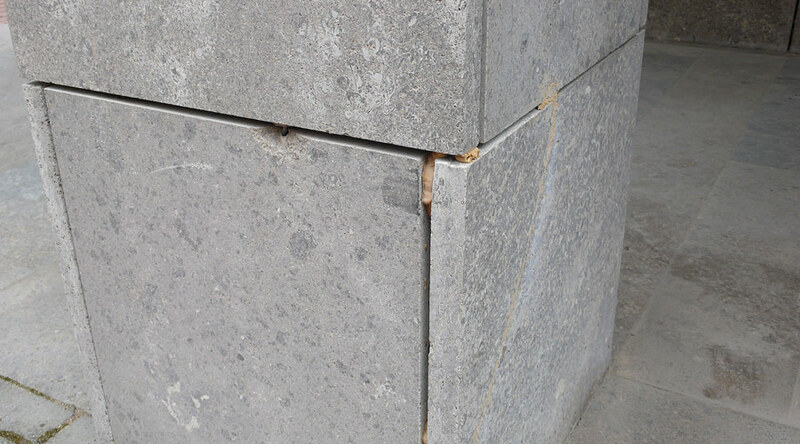 But Hans Stimmann’s berkish insistence that the future of Berlin should be a freeze-dried Imperial Era travesty sealed stone cladding’s fate as a sort of cheap, heavy, foundation cream. It was slathered on by mediocre architects, and probably greeted by investors keen on quick ROI with little Senate-side friction. A quick fix, then, for battered Berlin. And repair will be the reigning paradigm for decades to come when dealing with Stimmann’s crumbling inheritance, as these pictures show. One assumes that those yellowed globules are the coagulated residuum from the flubbed patch-job to the crack on the right. 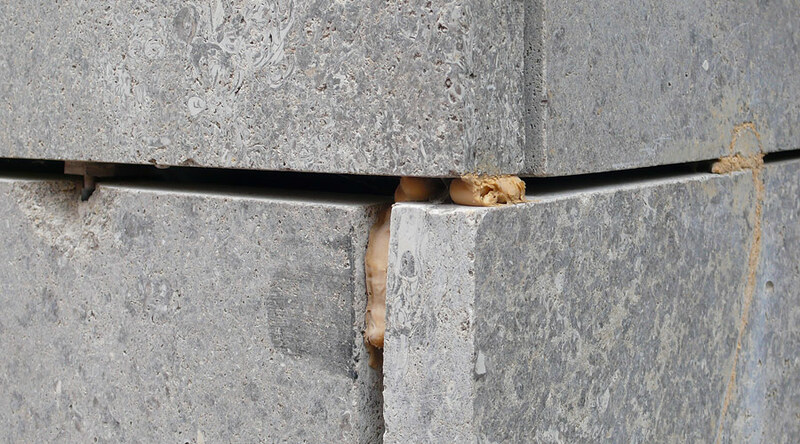 Maybe the gaps between panels (don’t tell me these gaping crevices are expansion joints) are just being used to store putty for the next round of repairs.